With hundreds of welders, welding generators, wire feeders and metal forming equipment on hand at Tri-City Mechanical, Repair Manager Martin Kellogg worked hard to keep the Chandler, Arizona, plumbing, mechanical and HVAC contractor in production mode. When the table on a coil line was bent and needed repair, Kellogg assembled a cadre of equipment and lugged a heavy 250-amp welder and an 80 cu.-ft. cylinder of shielding gas to the site…to spend about 30 seconds welding a single three-inch by three-inch piece of angle iron to level the table. Then he lugged it all back to the tool crib. The same went for other in-shop repairs and equipment modifications. If the welding needed to be done in a tight space or off the floor, he needed to get out a stick welder. If the project was large, this meant wasting time chipping slag and changing electrodes every 60 seconds. That was life before the portable Millermatic® Passport™ all-in-one portable MIG welder. Now, instead of taking 20 minutes or more to make a 30-second weld, Kellogg simply picks up the suit-cased style 45-lb. unit (55lbs. with a full gas bottle and wire spool. ), walks to the repair site, plugs it in to a 115V or 230V outlet, makes the weld and walks back to his office by the tool crib. If the welding needs to be done in a tight space or well off the ground, the Passport can go wherever Kellogg goes, allowing him to always use MIG welding, his preferred process. Designed to meet the portability and flexibility needs of maintenance and repair technicians, the Millermatic Passport Plus is considered one of the most portable and flexible wire welders on the market. Its inverter technology creates consistent arc starts and arc performance at a reduced size and weight. 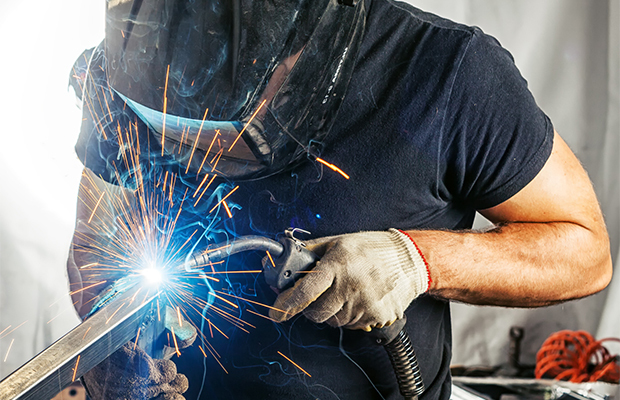 However, its most unique feature is an internal CO2 shielding gas cylinder (actually a paintball cylinder), which is capable of providing 25 minutes of welding time—or enough to make a fillet weld 25-ft. long on 3/16-in. material with .030-in. wire. With the Millermatic Passport in hand, all Kellogg needs to start welding is an electrical outlet. Recently, Kellogg was charged with modifying an old shape-cutting machine by attaching a rail on the side onto which the lead hangers slide. 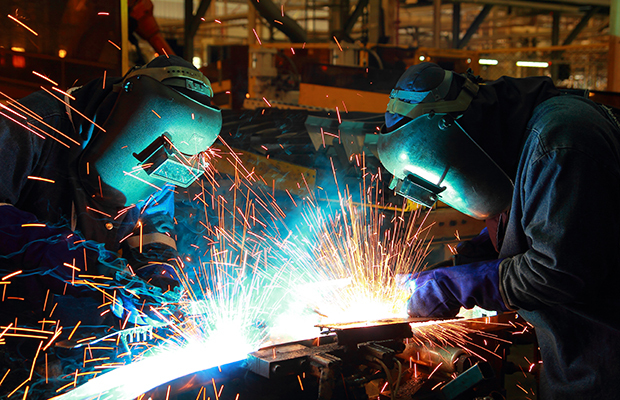 In the past, this simple task would have meant a time consuming process of assembling and transporting welding equipment to the site. With the Millermatic Passport, Kellogg simply grabbed the welder and power cord and went to work on the rail. Kellogg was equally impressed by the arc quality and weld penetration delivered by the portable welder. “The rail material was about 3/8-in. thick, and the unit had no problem with penetration,” he said. “I love the way the unit starts and runs, too. It doesn’t crack and pop and spatter at me when I start the weld. It’s a very smooth start, way better than non-inverter welders” (the Millermatic Passport uses inverter technology to reduce weight, improve portable welding performance and offer primary power flexibility). The Passport features an exclusive Multi-Voltage Plug (MVP™), which allows it to be plugged into either a 115V or 230V single phase outlet. Used with 115V power, the unit produces 30- to 140-amp output and can weld mild steel up to 1/4-in. thick. Plugged into a 230V outlet, it puts out a total of 180 amps and can make high penetration welds on mild steel up to 3/8-in. thick. The unit also features exclusive Auto Line Technology which automatically recognizes 115 through 230V single-phase power without the operator having to remove the cover to re-link the power source. The internal gas bottle is strictly CO2, but for bigger jobs or where a different gas mixture is called for, the Millermatic Passport also has a conventional inlet for an external shielding gas source. 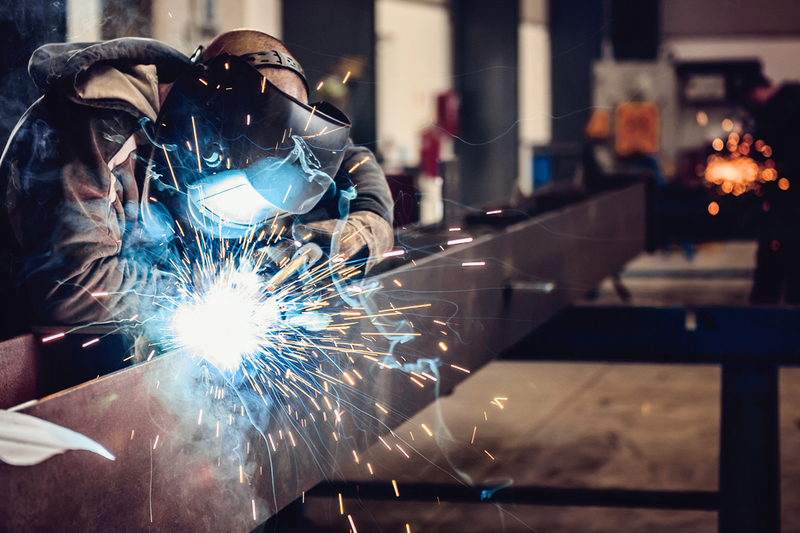 On repair sites, Kellogg saves time and energy putting the portable welder to use repairing pipes, ductwork and even other welders when they break. He reports that there is a significant difference in the amount of time it takes him to get the unit to the repair site compared to larger MIG welders. Further, he doesn’t have to string extension cords or worry about gas cylinders. “If there’s anything I can do to make my job easier, faster and more productive, I’m going to do it,” Kellogg said. Article courtesy of Miller Electric Manufacturing Company.